This website conforms to Australian Law in regard to commercial conduct. 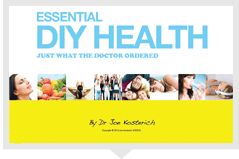 Dr Joe Kosterich believes in the transparency of opinion, association and source. Any compensation received for content will always be clearly identified as paid or sponsored content. Advertisements are accepted and clearly marked as such. Presence of advertisement or sponsored content does not imply recommendation of the content. Dr Joe Kosterich may at times be compensated to provide an opinion or review on products, services, websites and other matters. However, irrespective of the receiving compensation or not, he will always give his truthful opinion, findings, beliefs and experiences on those matters. The views and opinions expressed on this blog are those of their respective authors. Any representation made about a product, service or other matter should be verified with the manufacturer, provider or party responsible for the matter in question. This website may contain content, which may represent a conflict of interest. However such content will always be clearly identified. Disclosure Notice last updated on 11th March 2019.